MMS on 2G iPhone 3.1.3 for China Mobile (CMNET) – quick howto. Although most of my friends are using 3G/s now, I do get the odd 2G phone to play with. Today I had another crack at enabling MMS on a 2G. For some reason not much documentation, and too much misinformation out there on the net. Note #2 – 2G users – if you used BlackRa1n to jailbreak, this will not work either, and will b0rk wireless. Use PwnageTool, and create a 3.1.3 jailbroken / boot neutered (carrier unlock) firmware, install that first, then continue. Wait a bazillion years for cydia to timeout with the various blocked in China repositories. Normally we’d be done, however the MMS settings won’t let us save a diffferent MMS and GPRS name, so we need to install a specific IPCC (iPhone Carrier Setting file) for China Telecom. As China Telecom is (at time of writing) not an official iPhone supplier, they don’t have an IPCC file, so we need to roll our own. Download that, unzip, and throw on the desktop. We’ll need to tell iTunes that its ok to use the IPCC file first, so close iTunes. Now head off to terminal (or a DOS window for those on Windows), then paste this in. Ok, now open iTunes again, connect the phone if its not connected, and..
iTunes will prompt you for a file. Choose the IPCC file you downloaded. Finally… shut the phone off again. Once you power up again, you should be able to send/ receive MMS! Tested, and working on lots of 2g iPhones. CNNIC issued new guidelines for registrars and hosting companies on January 6th / 2010. CNNIC (China’s Internet Domain Government Agency) wishes promote the standard and healthy application of .CN domain names. CNNIC aims to coordinate with China’s review mechanism for domain name registration information and further crack down on registration of domain names with false information. What this means in non-government-speak is that from now onward new .com.cn and .cn domains cannot be registered unless you are an officially licensed entity within China. Existing domains can be renewed for the meantime though (pending verification of details/validity). Chinese domain name supervision organization China Internet Network Information Center announced that starting from 21:00 on December 14, 2009, it closed domain name registrations for individual users who are not purchasing domains on behalf of companies or organizations. Prior to this sudden announcement, China’s central television station criticized domain name registration service providers and agencies for false, inaccurate or incomplete information in the registration process. Entities wishing to register domain names for others will need an ICP许可证 (ICP Xu Ke Zheng). The ICP许可证 is a commercial licence, which is different from an ICP备案 (ICP Bei An). 1. Domain name applicants need to submit the formal paper based application material when making the online application to the registrar. The application material includes the original application form with business seal, company business license (photocopy), and registrant ID (photocopy). 2. Registrar should carefully review the application material. When application is deemed qualified, registrar need to submit the application material via fax or E-mail to CNNIC, and withhold the original application material. 3. From the day of the submission of online application, if CNNIC does not receive the formal paper based application material within 5 days or the application material auditing is not qualified, the domain name to be applied will be deleted. 4. The above regulations will be executed since 9:00AM (Beijing Time), Dec 14th, 2009. If you have any question, free to contact us at 86-10-58813000 or email to service@cnnic.cn. In addition to these new rules, all existing domain registrations are being scrutinized carefully, and all details are being verified. As we have been quite proactive in ensuring that all clients have ICP licensing, and keeping our upstream ISP / contacts at Shanghai Telecom advised of anything information they require ahead of time, we expect that this will cause minimal disruption to our services. If we do need to verify additional information from clients, please be prompt in forwarding them to us if we do request them, to avoid issues. Due to the above checks, new ICP registrations (which are required for any domain hosted in China) are taking substantially longer than the normal 2-3 days. We are currently seeing delays of up to 2 months for new license applications from the MII (Ministry of Information). We deal with the licensing bureau’s on a daily basis, and are notified quickly in case of issues, but the current checking requirements are just making everything take rather longer than is usual. We ask clients to be patient while their ICP registration is in progress. We are aware that it is not an ideal situation to have to wait for a few weeks, but we are dependent on the government issuing body, who are very very backlogged with work right now. License applications that are currently in process can be checked by clients at the government website here – http://www.miibeian.gov.cn/chaxun/ggcx.jsp. Computer Solutions client ICP Registration site is here – http://icp.computersolutions.cn/. New clients can register a user account on our ICP site, and submit an application form from our site. Noticed that our incoming TLS connection queue was a little high – running at 60 concurrent connections for an hour or so. A check of the queue revealed that all the connections were coming from a single IP – and were tying up the queue, making it a denial of service attack. This one ip address was connecting and reconnecting multiple times, hogging up all the connections. Although I’m loathe to call ourselves a corporation – we’re not!, we do try to do the odd bit of good for the community, whether locally, or regionally. Last year saw our first donation to the Library Project. The Library Project is a worthy cause, and donates books and libraries to under financed schools and orphanages in the developing world. Computer Solutions donated funds for a Library, which ended up going to Chen Jia Gou Elementary school in Shaanxi province. We also donate support to a more local cause – LifeLine Shanghai. Computer Solutions has been providing complementary IT, and Web Services for a number of years now for Lifeline. Last year, after a few months of persuasion they finally agreed to let us redesign their existing volunteer created website too. 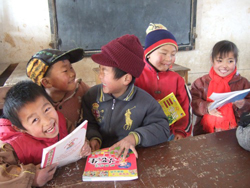 Lastly, we also support a cause which donates items and books for schools up in Qinghai. We’ve previously donated computers, funds, and other items to help out. More info about that here: http://www.tonyphotoshop.com/forum/index.php?topic=4.0. Do your part too, and help out, donations of clothes and other items are very welcome! Lastly, if you are a charity organization in Shanghai, or China, and would like us to assist you in some way, please contact us. We’re more than happy to donate our services to worthy causes.